Oberto is the second largest national meat snack company that now sells over 400 different dried meat products. Oberto Brands located in Kent, Washington, is a family owned company that was formed in 1918. In 1967, Safeway became the first national grocery store to carry Oh Boy! 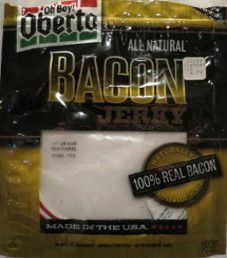 Oberto jerky. In 1994, they launched turkey jerky. Then in 2000, they aligned with the major global snack manufacturer Frito-Lay to expand their distribution network, which includes Canada, Mexico, Japan and Norway. This bacon brand of jerky was introduced in 2013. Overall, a very impressive success story, where the Oberto family took their fair share of risks to get where they are today. This jerky is cured in water, which is why you do not see the actual name of bacon in the ingredient list. Some people will argue that it is a healthier method of making bacon. We are not certain either way. The sugar level is very respectable at only 1 gram of sugar per 28 grams of jerky. The salt level is very high at 670mg of salt per 28 grams of jerky. In fairness, that is only a bit on the high side of a salt level for bacon. After doing some research in a United States Department of Agriculture website, the term ‘cured’ implies that nitrites are used. Otherwise, the term would be ‘uncured’ if no nitrites are used. 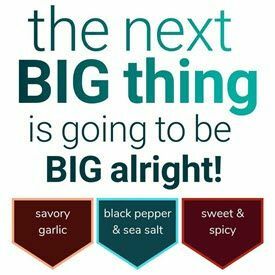 Interestingly sea salt is used, which contains many trace minerals, and is much less processed compared to regular table salt. Sea salt is really the main preservative used here. Admirably, this jerky does qualify to have no MSG added. These jerky bacon strips are more or less just small pieces of bacon. There is a somewhat dry texture. Handling this jerky definitely leaves an oily residue on your fingers. This bacon jerky more or less tastes the same as regular pan fried bacon. It is salty tasting, but not really that much more salty compared to regular bacon. It is a big hit with kids especially, who love the taste. This 2.5 ounce/71 gram bag of jerky cost $6.79, which works out to $2.71 an ounce. That equates to an expensive price. Note that bacon jerky is more expensive than beef jerky, so it’s more of an average price. There is nothing special here, you can do far better. The bag itself is obviously very professionally designed. Everything is imprinted directly on this resealable bag, both on the front and back. There are no clear slogans printed on this bag. 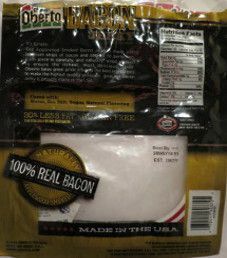 There are a number of facts states such as “All Natural”, “Made in the USA”, “100% Real Bacon”, “Naturally Applewood Smoked”, “No Artificial Ingredients”, “Minimally Processed”, No Preservatives Added”, “Family Owned”, “20% Less Fat”, “Gluten Free”, and “Providing quality meat snacks since 1918”. The majority of bag categories are covered here. A minor exception is that the weight is not stated in grams. To their credit, a toll free phone number is provided for customer inquiries.